The first thing my boyfriend said when we sat down was “the decor could do some work”, and although I disagreed, the place didn’t look as fancy in the daytime than my previous visit here. I still really liked the details of the wooden floors and chairs, brown leather sofas, grey stone walls, and the interestingly shaped wooden and ceramic platters. However, it was very disappointing that the service was not up to standards. I was exceptionally bothered by the fact that our server took our orders behind the sofa from where we were seated. I found it pretty awkward and disrespectful. Their lack of knowledge about the menu and passive attitudes were also unhelpful. A bit critical I know, but I’d expect the waitress coming from a high-quality and well respected Italian restaurant to at least know what the ‘soup of the day’ was. Two of us had the Lunch Set that included a choice of appetizer, daily soup, main, dessert, and coffee/tea. Prices includes the whole lunch set. Nice flavours. 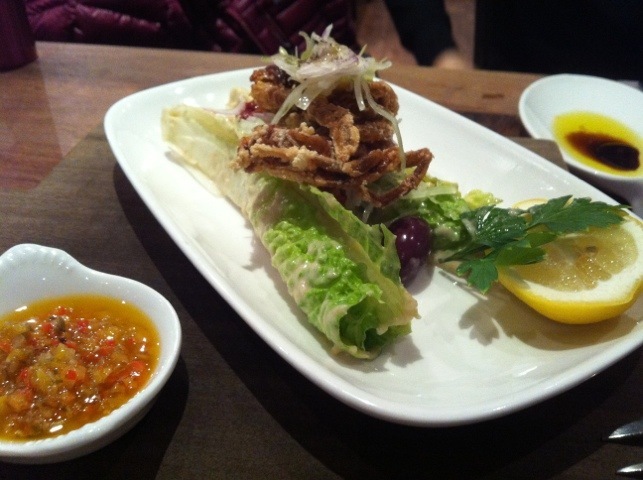 The soft shell crab takes a literal approach and wasn’t overly battered and at-all crunchy which I appreciated. It was soft on the outside, and crispy when you hit the crab. The salad was tossed in plain vinegar; simple and light. 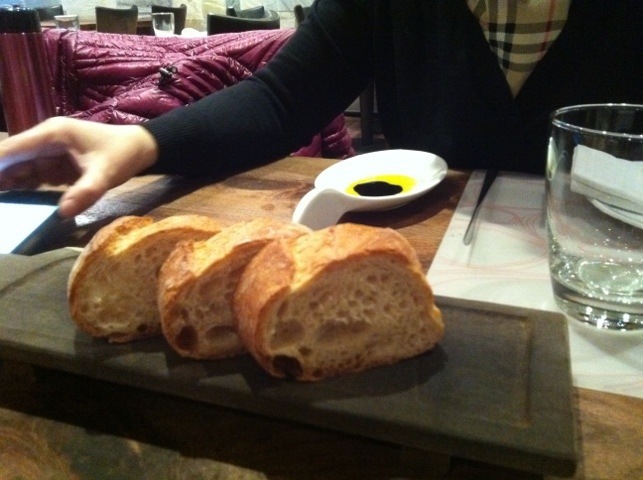 The bruschetta was filled with fresh tomato’s that spilled everywhere as I ate, and the bread was lightly toasted and remained its crunchy texture even with olive oil drizzled on top. 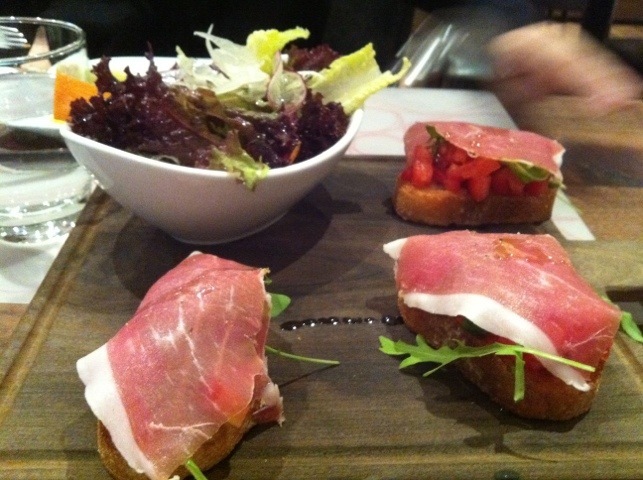 After my embarrassing encounter with the bruschetta, my boyfriend taught me the ‘correct’ way to eat tapas by Anthony Bourdain; lightly pinch the parma ham with your index finger while holding the bread with your thumb and middle finger. This way, none of the ingredients underneath would fall out. This takes practice though, trust me. 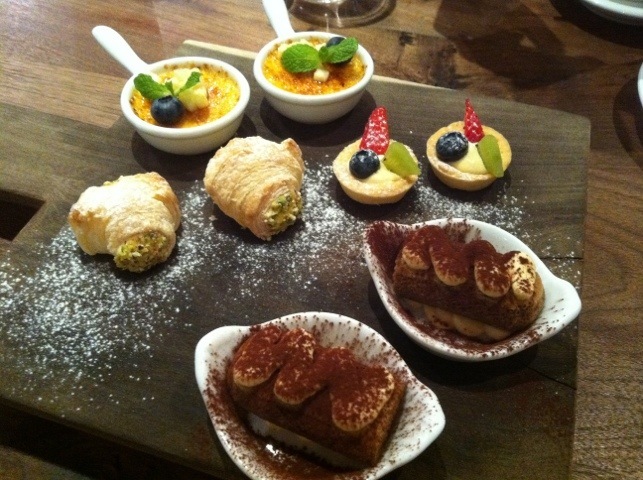 After the appetizers, we had the daily soup which is my favorite Traditional Tuscany Style Tomato Soup. I liked it the first time before, but this time it was even more savory. Anything that makes me feel healthy will make me happy, hee. 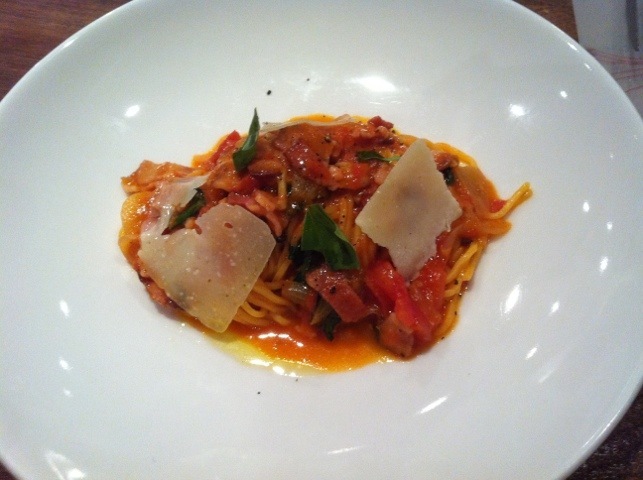 Chitarra is “pasta guitar” in Italian. It’s technically a ‘kitchen guitar’ and organ-like equipment that cuts fresh pasta into strands. It gives pasta a texture that is dense and chewy. I tend to find traditional Italian spaghetti too tough for my liking, but this was made very tender and chewy unlike the pasta I had at Osteria in the past. My boyfriend and aunt found the Pecorino cheese too salty but I thought it complimented the dish perfectly. We were originally going to order the truffle pizza before learning it was marked $2000!? 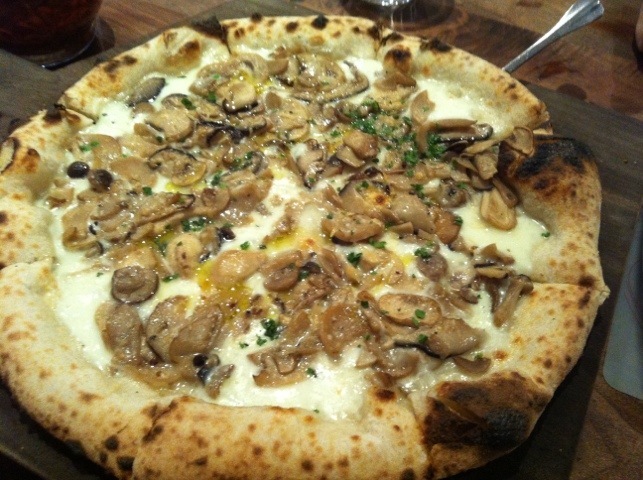 Soo we opted for the mushroom pizza instead. The crust is naam-like or pita bread than crispy crunchy Italian flat breads. It wasn’t what I was expecting and hoping for but it works.